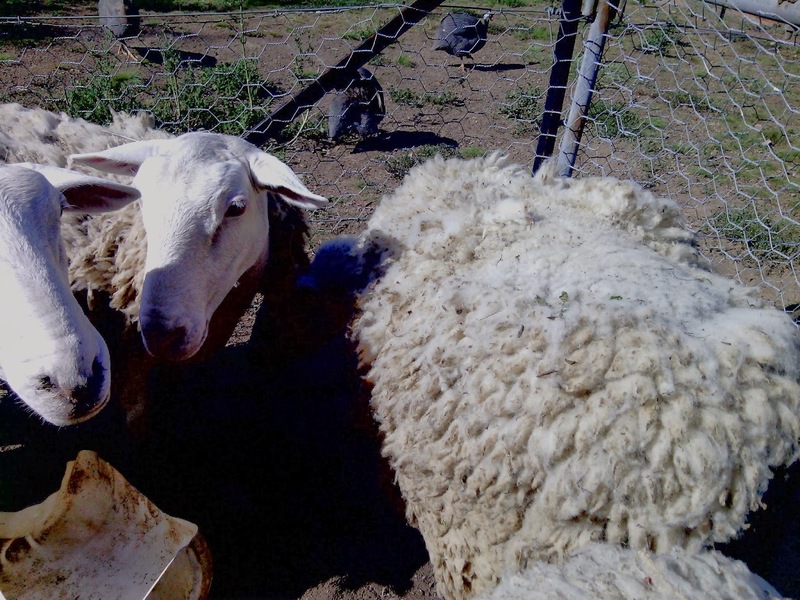 Desperate times call for desperate measures…or shearing sheep with scissors. The extreme heat of the last few weeks has driven us to take our sanity to the edge in regards to our sheep. They have been shedding their wool very slowly over the summer and I have left them to it as shearing in the middle of summer can sometimes lead to sun burnt backs (for the sheep as well as the shearers), but now they are beginning to grow their winter wool underneath the old fleece it is time to tidy up their haircut (woolcut?) a bit. We discussed getting someone to come and shear them for us or buying/hiring some shears but in the end decided that money is just too tight, so out came the scissors. We looked at a few ‘how to shear sheep’ sites and decided to have a go at shearing them while they were standing up. First we haltered one of the girls, in the handling pen with her sisters. That way she was calm and happy to be played with. Then my eldest daughter and I took turns cutting the old fleece off while the other held the lead rope. The sheep were surprisingly patient and calm while we did it, which helped matters immensely. 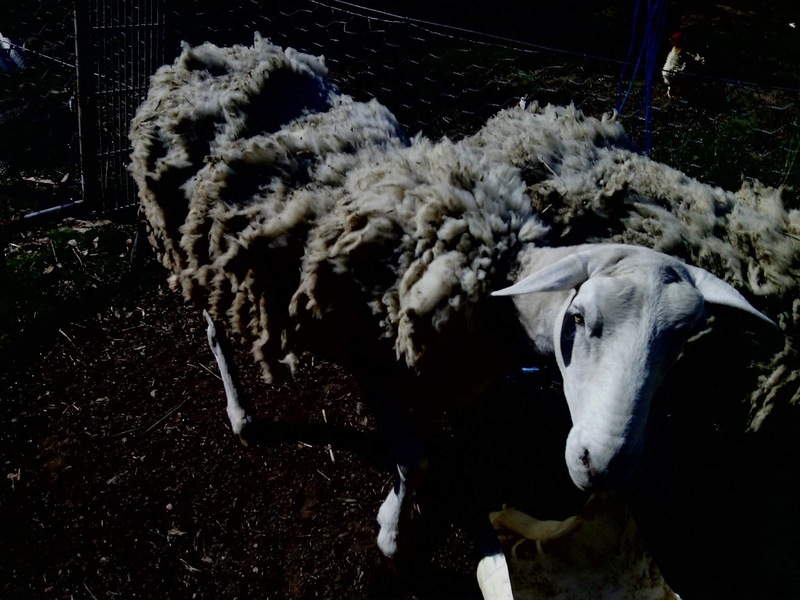 We sheared (clipped?) two of the four girls each one taking about an hour and a half to do. 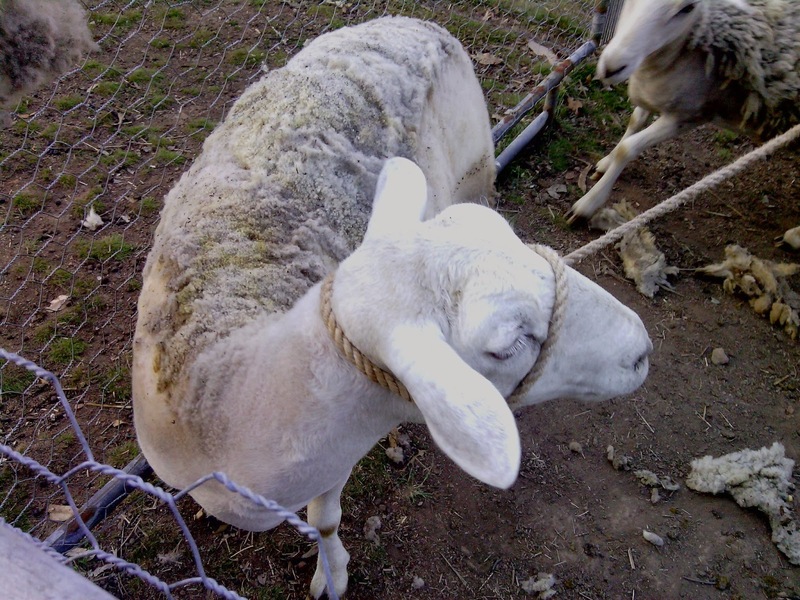 We had originally planed to do one a day as it its hard going and very frustrating work, but when we let the one shorn sheep go her sisters butted her and chased her from the herd (she looked different) so we caught the worst bully and gave her a clipping too. This seemed to even out the odds and they all got along again. I managed to salvage two shopping bags of usable wool from the two girls, the rest had started to felt and is too matted to use. Next year I will have to clip them in the spring so I can get better wool. 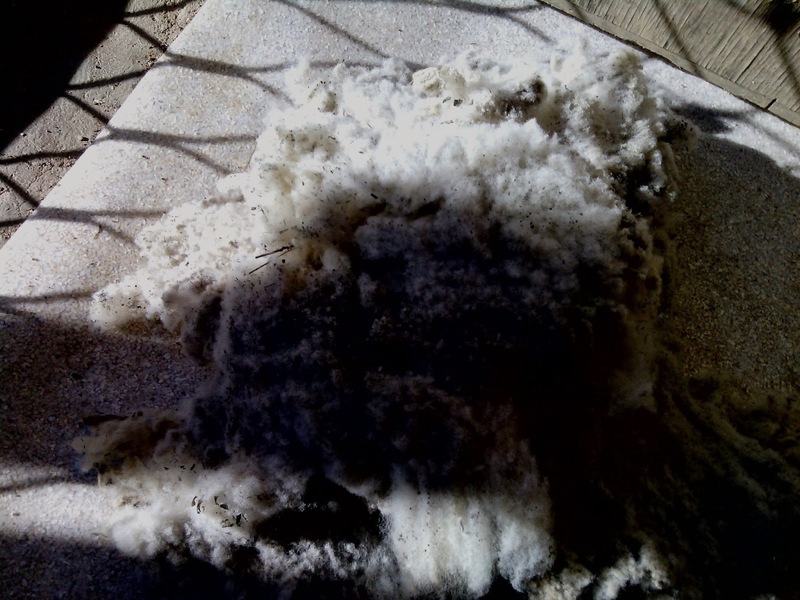 I got shedding sheep so that I didn’t have to worry about shearing if I had no use for the wool, but it seems I will have to shear them anyway. However, this is only their second molt, so it is possible their shedding will improve next year (I hope so anyway). 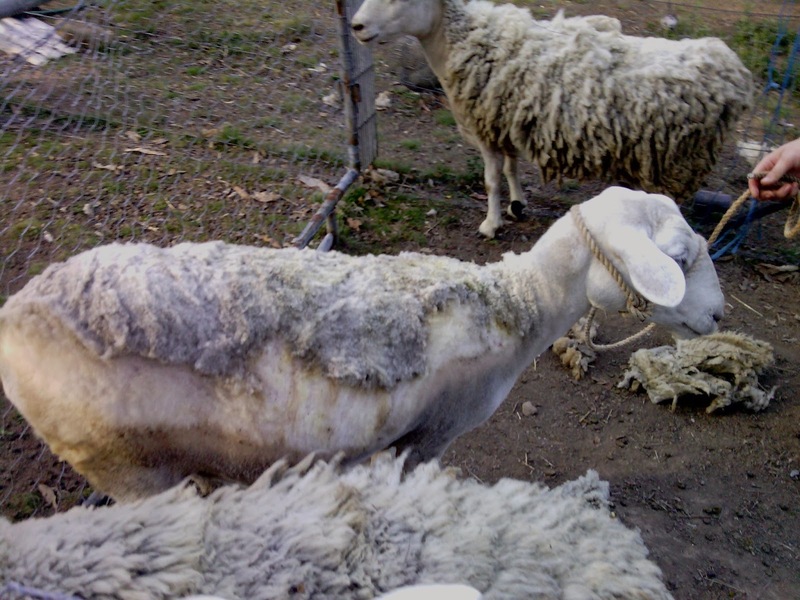 You can see where they have been shedding…and where they haven’t. This is Gaia after her clipping, somehow she looks smaller. She really appreciated the cool breeze on her skin, and being able to scratch every itch. This is the usable wool from Gaia and Kraken (sorry about the terrible photo), after I took all the felted stuff out and the really dirt stuff around the edges. 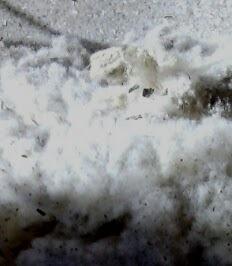 This is the wool close up, it looks like clouds to me. I hope I can get enough usable wool from my girls to make something to wear (it’s been a dream for a long while). The girls (Gaia and Kraken) certainly appreciate the new coolness, now to do the last two; Nut and Kore. What do you think I should make from their wool?